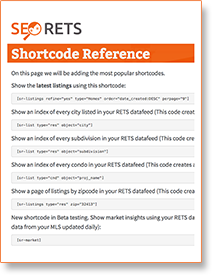 You’ll find lots of helpful information by checking out our Shortcode Cheatsheet, our Knowledge Base and our YouTube Channel for tutorial videos. Need help with setup and installation? If you need help installing, activating and setting up your new SEO RETS plugin, we can help. Hourly support packages are also available for general maintenance, or customized feeds. If you’re having any issues, or have a question regarding SEO RETS, please fill out the form below to contact our Support Technicians.